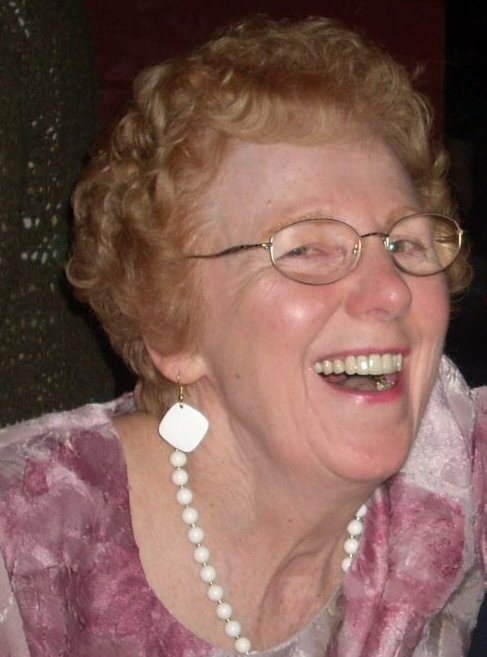 My Mom, Mary Margaret Megley Phalon Ondrick, passed away peacefully in her sleep early in the morning on June 3rd, 2015, just a few days shy of her 77th birthday . She was a bright, fun-loving spirit with a ready smile who taught me and my sisters about sharing, about independence, and about resilience. Mom’s early life wasn’t easy. Her father was first-generation Irish-American, and though a smart man, he never finished high school. He worked as a taxi driver, and for the city Parks department, and was active in the local VFW. 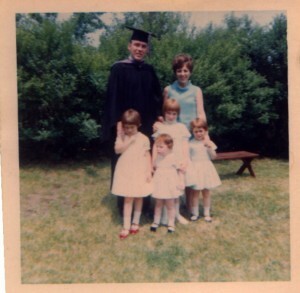 Her own mom wasn’t often around, so her Dad relied heavily on his sisters to help raise his three children. 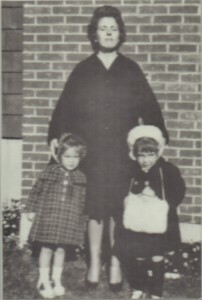 Auntie Mae and Aunt Sissy were Mom’s first babysitters. When they eventually married and had children of their own, Mom was there to help take care of her cousins. They didn’t have much money, but what they had, they shared with each other. Mom would have been around six years old when her Dad was drafted and she and her brother and sister had to move in with relatives until he returned several years later. As one cousin said years later, “What did it matter? Three to a bed isn’t that much different than two to a bed.” Many years later when my sisters and I were born, those cousins helped to raise us. The apartment Mom grew up in was small. She didn’t have her own bedroom – she slept on the couch in the living room. They didn’t have a bathroom, just a shower down the hall that they shared with other tenants. She graduated from Brookline High School with a swimming certificate, the ability to change a tire (but not drive), and a job at the town library. Contrary to every one’s expectations, Mom did NOT marry her high school sweetheart, though I suspect they may have been engaged senior year. He was too reckless, she said. One day she saw him driving too fast in a neighborhood where children were playing in the street, and she broke it off with him that day. She even (gasp!) moved out of her father’s house and into her own place for a short time. Then she met Jimmy Phalon. Mom was at the beach with some friends when they saw a thin, dark-haired boy walking down the sand with his nose buried in a book. Despite being from rival towns (Brookline and Newton), they hit it off, but it was a volatile relationship and they eventually broke up. Shortly thereafter, Mom was in a bar with her friends – a mixed group of boys and girls – and Jimmy walked in with some of his own friends. Naturally, he jumped to the conclusion that she was already dating someone else! He stormed over to the table, yelling about how unfair that was, how it was too soon after their break-up, how she should show more respect for what they’d had together. He banged his fist on the table so hard that they had to take him to the hospital. Mom, being 20, thought it was the most romantic thing she’d ever seen, and they got married the following year. Here’s their wedding picture with Aunt Sissy (on the left) and Auntie Mae (on the right). I was born 10 months later. This next picture was taken in the Spring of 1963, while my Mom was 9 months pregnant with my sister Sharon. Doesn’t she look proud? Mom always said that the only goal she ever had was to have a family and raise her babies, preferably girls. Lucky for her, she had four of us in five short years! This part of her life, too, couldn’t have been easy, but she worked hard to make it picture-perfect. My parents bought a house, and traded up a couple of times until we ended up in a house in Newton Massachusetts. It was a lovely house – 3 bedrooms, 1.5 baths, a big back yard, and a really good school system. The relatives often joked that we were the first “two-toilet Irish” in the family, but it was a stretch for my Dad’s income and money must have been tight. But this didn’t stop her, or even slow her down! 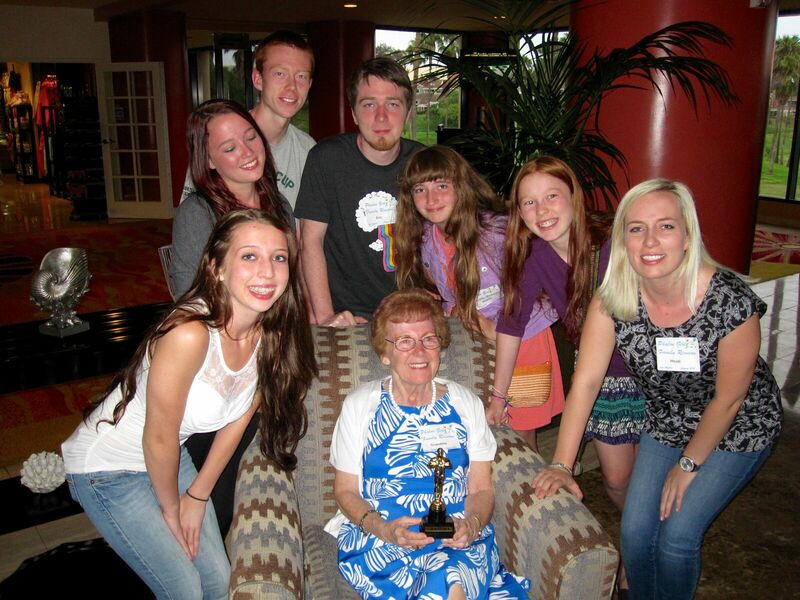 She taught us all to read before we hit kindergarten, and always told us that we could do or be anything we wanted. Though Mom did eventually get her driver’s license, they only had one car, so we went everywhere by public transportation. The five of us would walk to the corner bus stop and take the public bus to the West Newton branch of the public library, where we were each allowed to borrow two books every week. During the summer and on weekends, we’d ride that bus to the Woodland MBTA stop, then take the “T” in to visit family in Brookline. The four of us would spend the day at the public pool learning to swim (thanks, cousin Claire!) 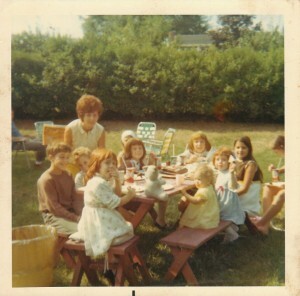 while Mom would visit with the aunts and cousins. They played Password and Parcheesi all day – at least, that’s how 10-year-old me envisioned them. We’d get back to the Alley at the end of the day to find everyone singing “When Irish Eyes are Smiling” and “Pennies from Heaven” and just having a good old time. Mom was on her own a lot because my Dad traveled a lot for his job, sometimes for weeks at a time. When he wasn’t traveling, he spent most week nights out taking night classes, eventually earning a law degree. When he wasn’t working or taking classes, he would come home and fall asleep watching television on floor in the den because he worked so hard and was very tired. It wasn’t until years later that he admitted to having a drinking problem; at the time, I thought it was all perfectly normal because that’s how my Mom treated it. I remember my Mom drinking tea (and constantly leaving her half-empty tea cup in random places around the house). She was proud of her Irish heritage and her red hair (even though it eventually had to come from a bottle). She wasn’t a great cook, but we never went hungry. Our meals were mostly mac-and-cheese, or “American Chop Suey” (macaroni with hamburger and canned tomatos), or fish sticks, or a noodle-and-meatball dish we called “Meatballs a Yum Yum” (sort of a simplified stroganoff). 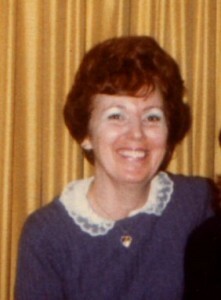 She loved to watch tv with us – Romper Room and Bozo the Clown and Rex Trailer and Mr. Rogers. Her own favorite shows were Perry Mason and “Larry” – that’s Lawrence Welk to the rest of us. I can still sing the closing song by heart! 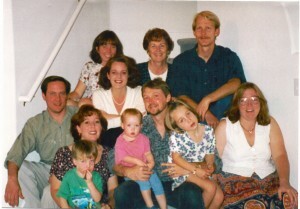 We spent lots of times with neighborhood families and cousins and people I thought were cousins but who turned out to be just really good family friends (and their children and grandchildren). 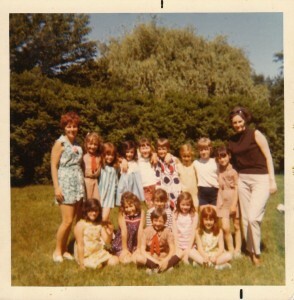 It seemed like almost everyone we knew was from a family with four or five kids, so whenever Mom wanted to get together with a friend or her sister, it meant a TON of children running around. All. The. Time. Here’s the four of us with Aunt Maureen’s five kids, with Joan Anderson’s five kids and a couple of other neighborhood children, with Aunt Narnie’s five kids and a variety of other relatives. 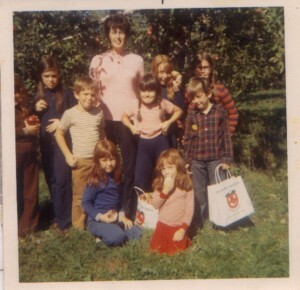 And, as if that wasn’t enough kids in her life, here’s the brownie troop she led with her friend Leona. In addition to volunteering as a Girl Scout troop leader, Mom was active in the community in other ways. She was on a bowling team for a while; she was active in local city politics, campaigned for her favorite candidates, and even ran for Democratic City committee once (and won!) It must have been devastating for her when our Dad, newly sober, decided to leave her in 1979. She was no longer the modern version of Donna Reed; it was the end of the fantasy of a perfect suburban life. 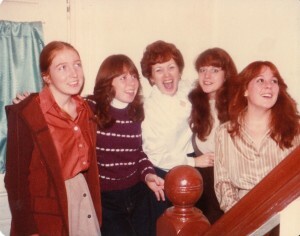 By this time, we girls had all moved out and started having families of our own. Mom took in a series of boarders, I think as much for the company as the financial help. Not so much because she was lonely (though she certainly missed us), she just liked having lots of people around her. There was a string of boyfriends who adored her, and were delighted to help around the house or chauffeur her around. When asked if she thought she’d ever get married again, she’d say “Been there, done that!” and laugh. Luckily, it’s super-easy to find photos of her laughing! Mom was always throwing big parties – certainly for holidays like Christmas and 4th of July and St. Patrick’s Day, but also for random events like “Sally moving to Oregon” and “Brenda getting back from vacation”. She’d invite everyone – the four of us and our boyfriends/husbands/children, aunts and uncles and cousins, any other friends and relatives who happened to be around. She’d lay out enough food for everyone for a week, then insist we all take home some of the leftovers. She’d buy cookies and pretend she made them herself. She’d run across the length of the house in her high heels if she thought someone was videotaping because she wanted to be part of it (thanks to cousin Mary Elaine for sharing those tapes!) 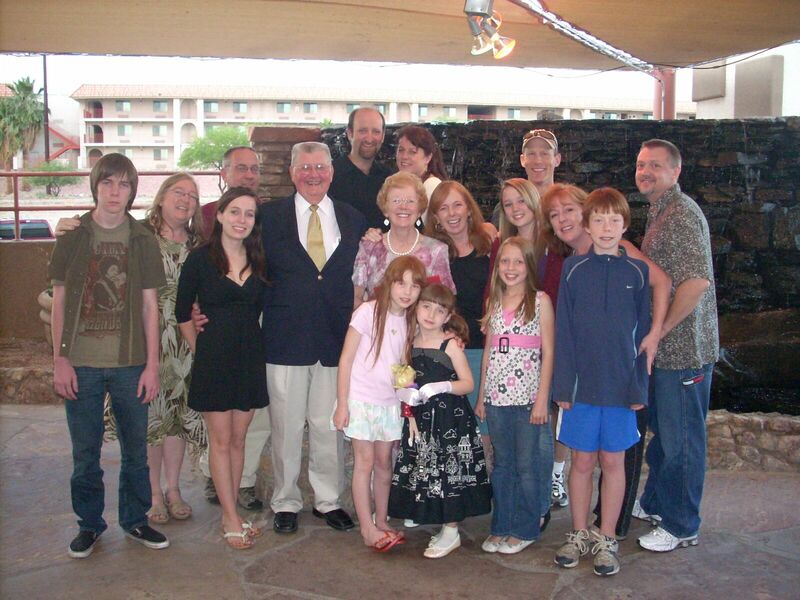 Mom’s happiest days were when she had all of us – daughters, sons-in-law, and grandchildren – together in one place. As we spread out across the country, this happened less often than Mom would have liked. When we did all get together, she’d look around and proudly announce “You know, I’m responsible for all of this!”. 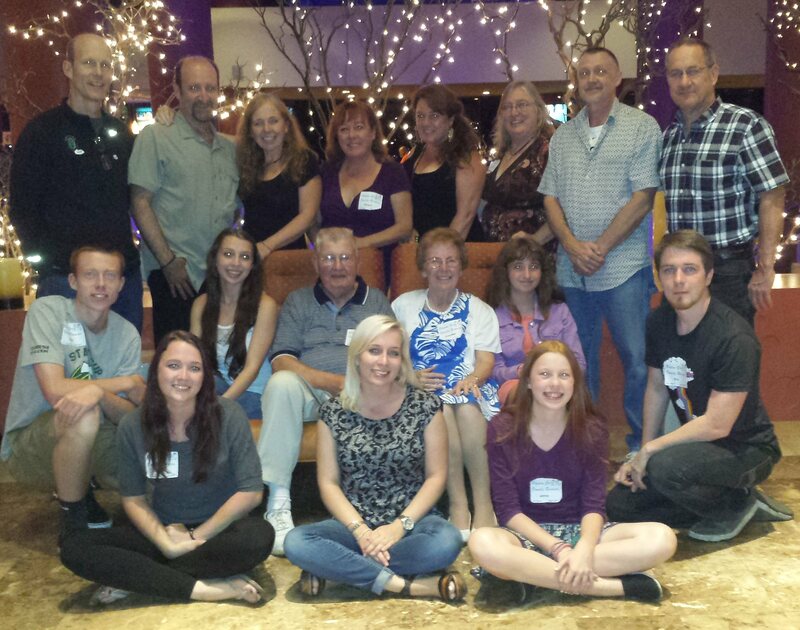 Here are a couple of group shots from 1994, 2004, and 2014, all with Mom right in the middle. For several years, Mom was a member of the Ladies Auxiliary of the Ancient Order of Hibernians (an Irish Christian fraternal organization). She enjoyed the social activities, made some good friends, and always helped out with their charitable dinners and casino nights and whatnot. 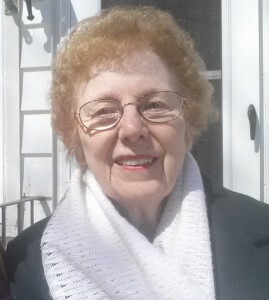 She even served on the LAOH executive board as secretary, responsible for creating a monthly newsletter. But it bothered her that she wasn’t allowed to be an actual Hibernian, that the organization was split along gender lines. When she learned that the Benevolent and Protective Order of Elks (also a Christian fraternal organization) allowed women to be full-fledged members, she joined them instead. And that began what really was Mom’s happy ending. Mom started dating fellow Elk Steve Ondrick, and they fell in love. I’m sure it took a lot of compromises on both their parts, but from where I sat (on the other side of the country), it was a true match made in heaven. Steve wanted nothing more than to take care of Mom; she wanted nothing more than to let him do so, and eventually Steve convinced her to marry him. The morning of the wedding, Mom brought a giant garbage bag to the hotel where we were all staying. Inside was a collection of all the things from her prior life that she was both literally and symbolically giving up, including the wedding album and rings from her first marriage. 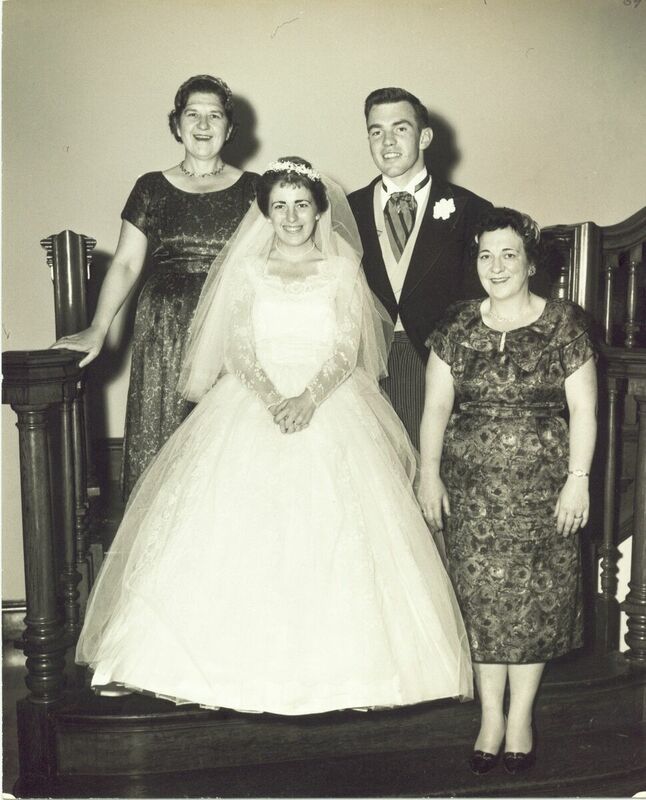 Later that day, the four of us walked her down the aisle and she became Mary Ondrick. She was proud of us, and loved us, but it was Steve Ondrick who made her happier than I’d ever seen her before. They remained active in the Massachusetts Elk community and his home lodge in Weymouth for many years. 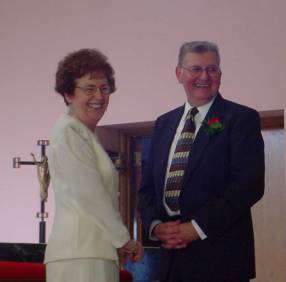 They traveled all over the place, they loved to go on cruises, they spent an extraordinary number of weekends down at a place on Cape Cod called “Irish Village” because that was her favorite get-away place. I don’t recall them ever going to a “Polish Village” in honor of Steve’s heritage, but I think that was ok. Steve was happiest when he was making Mom happy. I wish that was how the story ended, but it isn’t. A few years ago, Mom was diagnosed with Alzheimer’s Disease, and started losing her memory. At first, she seemed relieved to have the diagnosis because she didn’t want people to think that she was ignoring them out of spite or anger – it was just the disease that made her forget. It got more and more difficult for them to travel, and Mom became less and less capable of handling day-to-day tasks. Eventually, as is common with Alzheimer’s, she started getting frustrated, paranoid, and angry. The end came relatively quickly, with a sudden and complete mental breakdown in May, followed by a couple of weeks in the hospital and hospice care, and a quiet passing around 2am on June 3rd. I’m glad I was able to make it to her bedside before she died, though she was already past talking. 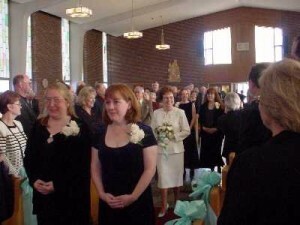 At the wake, everyone kept telling us how much fun she was, how she was always happy, how much they enjoyed her company. As she would have wanted, all seven grandchildren participated in her funeral service. All this has reminded me of a couple of things about how I want to live and how I want to be remembered when my time comes. First, I want to make good use of the time I do have. I want to try new things and learn new skills and express myself in new and different ways. And yes, I want to be happy and make others happy and have fun in whatever ways I can, just like Mom did for most of her life. More importantly, I want to do better at keeping in touch with the family and friends who mean a lot to me. We have the means to communicate with tools and technologies that absolutely flabbergasted my Mom. She never did get the hang of Facebook or digital cameras or even email (we’d have to print stuff out and snail-mail it to her). But I know we can do better. We can be part of each other’s lives even though we’re spread out around the world. 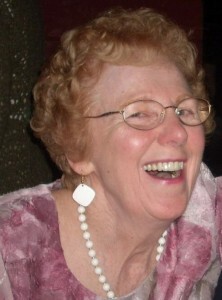 Mom lived her life at full speed until near the very end, and I hope I can leave half the legacy she has left us. Brenda, I didn’t know your mom. But I can tell from this wonderful portrait that she was a wonderful person. Thanks for sharing this. Well done Brenda . Full speed lifers an understatement. Love you mom, love our family no matter what. Brenda, Such a beautiful tribute, so thoughtfully written, one of the many things that I admired about her is that she really encouraged you and your sisters both career wise and personally to be true to yourselves and to develop your talents, something I don’t think anyone did for her. She was strong in so many ways and gave out a lot of love and lived with gusto, humor, optimism and determination. We will always miss her, so one of a kind, such a positive presence. My mother died when I was eleven, how I would have loved to really know her as you did the Raster, as Mary always called her. Really like your statement of how you want to live your life and from I can see you are doing jus that. My Brenda, she would say is so talented, I don’t know how I got such a smart kid but I did. This was such a beautiful tribute to your Mom. 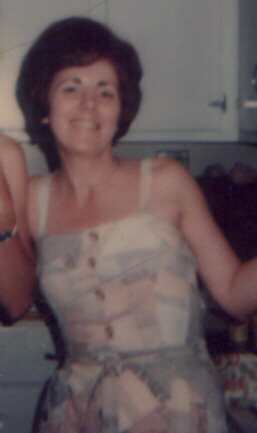 I am so fortunate to have been the recipient of your Mom’s love and caring all through my high school years. She was such a wonderful woman and you have done a great job honoring her memory. Hugs, Brenda! What a beautiful tribute to your Mom! I love that she laughed so much in her life, despite the difficulties she experienced. You are good at that, too, and also have a generous and loving spirit like your mom. I’m lucky to count you as a friend. Such a beautiful tribute to your mother! I remember the house in Newton and playing there when we were very young. All the best to you and all your family!